We carry a wide collection of sports memorabilia. 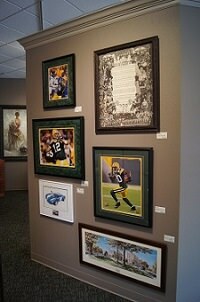 From Brewers, to Packers, to Badgers to Bucks, all autographed pieces are certified. No matter the item you can be assured that it is presented in the best way possible. We have professional jersey, football, baseball and helmet displays. Autographed pictures are framed and matted by our highly qualified art designers and take on the quality that you can only get from an art gallery. Do you have your own item to frame or shadowbox?